Here’s an updates on what we’re working on in Cycles. Up to now, the features that we’ve added for the 2.64 release are BVH build time optimizations, exclude layers, motion/UV passes, filter glossy option, a light falloff node, a fisheye lens (by Dalai Felinto), ray length access (by Agustin Benavidez), and some other small things. There’s also now a page in the Cycles manual about Reducing Noise in renders. All of these tricks are used in production with other render engines and should apply to path tracers in general. Currently there’s still three major features on my list to implement: motion blur, volumetric rendering and a contribution pass. 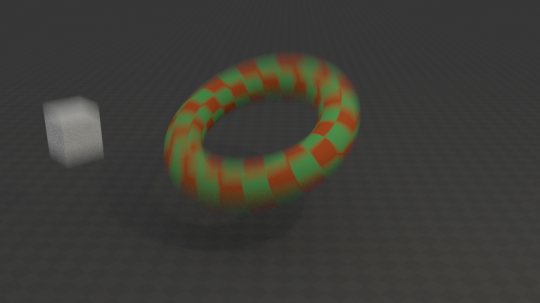 We already have a vector pass now for doing motion blur in compositing, but real raytraced motion blur would be nice as well. The code for this is mostly written but work is needed to make this faster, currently it’s slowing down our raytracing kernel even if the there are no motion blurred objects. Volumetrics should be a target for 2.65, so the release after the one we’re working on now. There’s already a developer who has patches to add volumetrics to Cycles, we’ll need to review the design and add support for rendering smoke and point cloud datasets. Currently volumetrics are being rendered with Blender Internal, and probably in production they end up in separate layers anyway, but it’s not very convenient to mix render engines and have to switch back and forth. The idea for the contribution pass is that’s it’s like the only shadow material in Blender Internal, but more flexible and interacting with indirect light, to help compositing objects into footage. How this will work exactly is unsure still. Improving core raytracing performance (SIMD, spatial splits, build parameters). Decoupling AA sample and light sample numbers. Currently one path is traced for each sample, but depending on the scene it might be less noisy to distribute samples in another way. Better texture filtering and use of OpenImageIO for tiled image cache on the CPU, so we can use more textures than fit in memory. Texture blurring behind glossy/diffuse bounces. Like the Filter Glossy option, this can help reduce noise at the cost of some accuracy, especially useful for environment maps or high frequency noise textures. Non-progressive tile based rendering, to increase memory locality, which should avoid cache misses for main memory and the image cache. Adaptive sampling, to render more samples in regions with more noise. Better sampling patterns. I’ve been testing a few different ones but they couldn’t beat the Sobol patterns we use yet when using many samples (> 16), still hope we can find something here. Reducing memory usage for meshes (vertices, normals, texture coordinates, ..). Improve sampling for scenes with many light sources (just rough ideas here, not sure it will work). Hopefully these changes together with careful scene setups will be sufficient to keep render times within reason, but beyond that we can still look at things like irradiance caching or other caching type tricks. I hope to avoid these because they don’t extend to glossy reflections well, I’d like to try to keep things unbiased-ish, it seems to be the direction many render engines are moving in, and it’s easier to control, maintain and parallelize over many cores. Happy days! You’re really working hard on this (as usual) and I really appreciate your efforts! That’s the volumetrics mentioned in the post, it’s not yet possible but is a target for 2.65. Right, this we’ll base it off that as hinted at in the post. I’m not sure yet how it will work exactly, it will depend on the algorithm, making it really robust is very hard and most algorithms fail already on simple things like soft shadows so I haven’t decided yet which one to use. Probably there will be a way to configure the integrator in such a way that it renders to a certain smoothness level. Motion pass, light falloff node. Coooool! This is great! Was there any plans to add normal map support into cycles? Is it even possible? I imagine some game artists (like me!) would love to use cycles as a user friendly rendering engine for showing off work. Probably at some point, but it’s not a priority at the moment. WOOHOO! Thanks for the response Brecht, that’s great to know it’s possible and on the list. There’s plenty to be excited about with the current mango related list. I’m curious when is the support for Kepler and Cuda 3.0 (Driver 4.2) planned in? Do you have a plan for that? Thanks in advance, great work Brecht! 2.64 will almost certainly come with support for these cards, but we need to work around a bug in the 4.2 toolkit that’s causing wrong renders still. This might not need to be as big of a priority as many make it out to be. The Keplar architecture simply isn’t very optimized for GPGPU tasks. The GK104 has been castrated in terms of compute in favor of gaming performance. The 680 only performs as well, if not often worse, than a 580 in compute speed. Thank you, CPU-compatible optimizations was one of the things I was hoping to see developed during the Mango project. Something which would reduce the speed gap between CPU and GPU rendering so you can have faster rendering while taking advantage of the extra RAM that usually wouldn’t be found on the GPU. All while allowing many users like me to not have to pay an extra cent for brand new hardware to get closer to the speeds that people using the GPU were enjoying for months. With various performance optimizations, would it be difficult for you to implement some that gives a big boost at the cost of visual fidelity, but with the option to turn them on/off on a per frame basis? So if you have a fast moving shot sequence with lots of motion blur, maybe they could be turned on, but then for another sequence that is slow or has no blur at all turn them off? There’s been interesting research in this area, filtering of monte carlo renders, but very little of it seems usable for production rendering. If you look at the video that comes with the RPF paper, you’ll see a lot of flickering. The render results are blotchy, the simple scenes or the textures just hide it in still images. I think for any method that does this kind of noise smoothing, there should be a feedback loop to guide the sampling (like e.g. irradiance caching has). If you blindly smooth out noise after all the samples are taken, no matter how advanced the method, it will never be reliable. Interesting to think about but not immediately applicable. One of the Luxrender developers has actually tried an RPF implementation, I believe he came to the conclusion that it wasn’t worth the enormous amount of memory that would’ve been needed for a high quality render. True, it’s one of the most advanced denoising algorithms out there right now, but last I read it requires a truckload of RAM if you want to make good use of it. So in part because of that, I personally think we should avoid post-process denoising effects if possible and reduce/eliminate the noise issue through the performance and sampling enhancements and optimizations like seen in the list. Mesh light in manual probably needs a third image of the wireframe as I didn’t get it. My Cycles wish list is almost completely fulfilled (obviously the optimizations can certainly keep coming). As a character artist one thing I am absolutely dying to have is hair and sss in Cycles. I can’t wait. I wonder if vector pass for motion blur in compositing will work OK with render time depth of field? Thanks guys!! Cycles is nothing short of amazing. Soon we will be seeing amazing work done with Cycles. Can’t wait to start playing with motion blur in cycles, please add a GPU compatibility for the motion blur as well, would be awesome. Any estimation date of real motion blur in cycles? So sooner or later rendering hair and fur will also be possible in Cycles? Yeah. According to this post on the Blender development blog http://code.blender.org/index.php/2012/01/cycles-roadmap/ . I can’t wait. Your cycles development is progressing so fast I am almost embarrassed to trouble you, but… could we have a texture image sequence node to allow rendering animations with dynamic paint in cycles? Brecht probably you can add the “geometry|incomming” node in the how to reduce node page. See the result in BA : http://blenderartists.org/forum/showthread.php?216866-Cycles-tests-the-new-blender-CPU-GPU-renderer-of-awesomeness&p=2100349&viewfull=1#post2100349. Great work Brecht! I’m very impressed and excited with these speedup improvements planned for 2.64. One quick question: will the new version of cycles also incorporate Mike Farney’s “glossy anisotropic” shader? From the thread, it looks pretty much completed, and just needs some code review before being incorporated. Great work Brecht! I’m really looking forward to the CPU optimizations, motion blur, and volumetrics. Have you had any help from AMD/Nvidia/Intel with this Part/Project of Blender. I really think they could help? I would be a big Win to get a Large company to support/sponsor the Cycles project. Also they could help with rendering of Mango. I wonder if the use of random calculation of reflections might be replaced by something deterministic. I mean the calculation of for example reflections, where either the reflection is calculated or the diffuse value, depending on chance. First iteration: Is the top bit of the reflection value set? then calculate a reflection path, otherwise the diffuse. The result gets weight 128 in the buffer. Second iteration: Check the top-1 bit. Calculate either reflection or diffuse path again. The resuklt gets weight 64 in the buffer because of the bit position. Multiple reflections will become a problem if the the same bit of every reflectivity in a ray is checked. A pattern could be devised for sampling where the first reflection gets the most bits sampled and later reflections are sampled in the old way. Does the above make sense or is it total nonsense? I hope too Cycles will optimize more on CPU. Actually, in commercial software CPU continue to do great work and improve drastically the performance and quality result (take a look at clarisse FX). All the commercial software seems move again on CPU, and all GPU rendering look practical stop (octane, airon etc. What is current status of 2.64 CPU optimizations, i am certain too that in future we get very fast and powerful CPU-s. My vote goes to CPU.